One thing I have learned -- is that life is full of changes. Some changes are good, and some are not so good. My husband passing away was not a good change. My daughter family moving in with me is basically a good change. Moving from a larger stamp room to a smaller is both good and not so good. The not so good aspect of that was having to sort through and and get rid of stuff. The "good" aspect of all this is sorting through all of this stuff and deciding what will I really keep and really use. So really getting rid of some stuff is also a "good" thing. One thing I knew I would keep is all of my "card starts." Although now it is in a basket and not a plastic drawer. The parts of the background on this card were from this basket. Then I added the focal images. 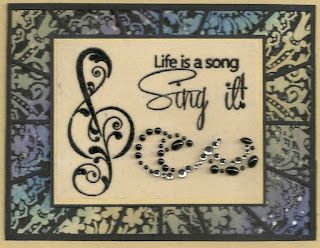 The Technique Junkie stamps I used are Life is a Song http://techniquejunkies.com/life-is-a-song/ and Treble Clef http://techniquejunkies.com/treble-clef-small/. I stamped both of these on card stock vellum, used my Xyron machine to adhere it to a pale yellow card stock. I then mounted that panel onto black card stock and trimmed off the excess. I added part of a black pearl and rhinestone embellishment. It is just lovely. The saying is so true. 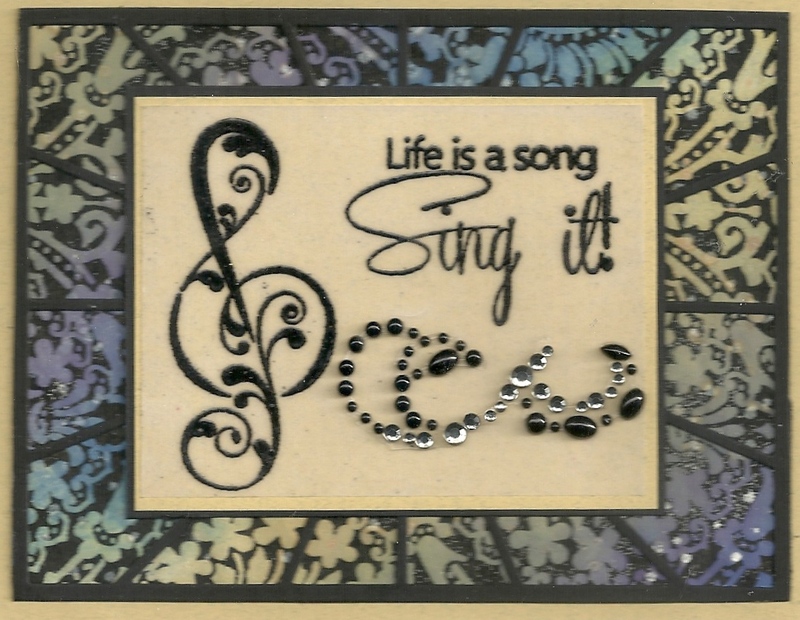 Sing your life song - and make a cheery tune! After my husband died so very suddenly in June, or daughter, hubby, and 3 children moved home from Romania where they had been serving as missionaries. I have several health issues and while much of the time I am just fine, when I get sick -- I get very sick. So they will be here for a while -- at least a year -- until we see how things go. Moving five people into my home for a long term basis required space adjustments as well as many other types of adjustments. One of those "space adjustments" was to move my stamp room from a larger room to a much smaller room. Therefore, I have had to get rid of a lot of things. I sold a LOT of background paper and empty scrapbooks at a garage this past weekend. I sold a LOT of stuff! But I still have a lot of stamps to get rid of that will not on my shelves. I have eight boxes packed as full as I could get each box. This is a grab bag box of stamps. I do not remember what stamps I put in what in boxes. The stamps come from these companies: Stampin' UP!, Sweet and Sassy Stamps, Outlines by Magenta, Firecracker, Inkadinkadoo, and others! The small flat rate priority boxes will cost $20 per box which includes shipping. The medium flat rate shipping boxes hold more than twice what the smaller boxes will hold. There boxes will $45 which included shipping. Every box has at least one stamp which is wood mounted and the larger boxes may contain more. None of the boxes contain DVD containers for the stamps. But they are usually labeled as to the stamp company. There is a lot of stamp money in each box! I only accept Pay Pal. Let me know you want a box and I will send you my email address. I will ship after I have received your payment through Pap Pal. Any one who has been reading my blog knows by now that I am in the process of moving my stamp room from a larger room to a smaller room. Today is my assigned day to post for the Technique Junkie Design Team. 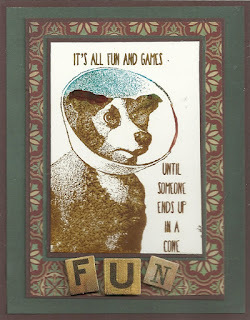 And since I have "enough of my supplies" moved and settled into my stamp room, I was able to make one card. Stage Four involves lots of rods and lots of shelves. Punches and stamp sets in tight spaces are not always easy to store. Punches are bulky and cumbersome. So they are stored on IKEA Bygel rails -- and extra rods as well for the "future." Stamps -- well if you are a stamper you all know you do not have just a few, you have a LOT! And I do. Many stamps I will sell -- somehow. But I need to store them all on one wall. A friend came over on Saturday and helped me bring up all of the stamp sets and a lot of other stuff. I printed labels for each section any particular shelves - otherwise there would be no other way to identify the stamp sections. Some shelves have several labels while other shelves only have one label.It would be a nightmare to put things away. I am going through lots and lots of things -- and deciding whether or not to keep it, sell it, give it away, or trash it. More pictures to come in a couple of days! Stage 3 - The Mess! Any one who has ever moved knows before stuff is all organized, there will be a mess. Going from a larger space to a smaller space means a greater mess before it is all arranged. Believe it or not -- THIS mess is progress. And hopefully very soon it will all be organized. Stage one was painting. Stage is installing cupboards. So on Saturday my wonderful (and very handy) son-in-law worked on installing the new cabinets. Moving stuff will likely be slow as I have to really ponder what is the best place to put stuff. And every paper crafter has a lot of stuff. Right now my old stamp room is bursting at the seams with stuff. I have to be decisive about what I MUST keep, what I can keep, and what I cannot keep no matter what. As you can see a couple of grandchildren helpers had to check out the inside of the cabinets. So what is next? Stage Three will be lots and lots of shelves -- everywhere. There will be three shelves above the counter - and they will hold paints, spray bottles, glitter and embossing powder jars. Another wall will be all shelves- and those shelves will hold my stamps. On another wall will be lots of Ikea By-gel rails which will hold my punches. Life is full of changes. Some changes are pleasant and some are sad. Some are fun, and some changes are fun. And nearly always, a "big change" necessitates other changes. Because of my husband's sudden passing (not a good change), or daughter, her hubby, and three kids have moved back from Romania. All of these changes was totally unexpected. Then because of their moving home to be with me and be a help to me -- I needed to move my stamp room to be on the main level of our home. Our daughter and son-in-law will have my old stamp room for their bedroom. This change is good. So many changes have a cause and an effect. In order to make our office into a stamp room, furniture had to be moved out, everything on the wall taken down, walls prepped and primed, and then painted. New curtain rod up and new curtains as well. Plans had to be made for where to put things and how to do this with the most efficient use of space. The current stamp room is 10 x 12 feet. The new stamp room is about 9 x 10 feet. So that is a loss of square footage for storage. I have a LOT of stuff in the current stamp room -- which also is used for scrapbooking and sewing. So there is a lot to be considered for these needs. I have a LOT of ribbon, a lot of paper, a lot of punches, a lot of embellishments, a lot of coloring mediums, a lot of ink pads, a lot of stamps (a whole lot) and a lot of just stuff! So careful planning had to be done. Just how will I make the best use of the space I have available? This is the end of the painting stage --- and new storage will begin to be put in place tomorrow. Then more pictures will be taken bas progress goes along for this new room. I have lots of ideas form other folks' stamp rooms. I like some of my storage and it works for me. Every craft room is different because everyone's needs are different. My previous stamp room was a mis-mash of things I had, things on sale that could be easily utilized, things that were new and used for a specific purpose, and what worked for me in my space and my budget. Her are some pictures from my old craft room -- and you will see what I mean by a mis-mash of storage. I am looking forward to reorganizing all my stuff in new ways. I want o keep it all, but I do not think it is possible. I hope by this time next week it is done. We will see if I can accomplish that goal. Check back for pictures of my progress! August Blog Hop for Technique Junkie Stamps! Today is August 1 -- the first of the month. And in the Technique Junkie world that means a Blog Hop! So today I am featuring four NEW stamps from Technique Junkie Stamps. If you are starting here at my blog, please go to http://techniquejunkies.blogspot.com for the entire Blog Hop. My first card features the new Zebra stamp appropriately called -- "Zebra ATC" - http://techniquejunkies.com/zebra-atc/ - SD622 and the words come from a set called "Zebra Sayings" - SS047 - http://techniquejunkies.com/zebra-quotes/. I created the background for the image with spray Distress Inks. After it had dried I stamped the image with Versafine Black ink and heat embossed the image. Then with the scraps, I did the same with the saying. I spritzed the background paper with a quick couple of bursts with spray Distress inks as well. For the next card I stamped the image with Tuxedo Black Memento ink. I used watercolor pencils for the skin and the hair. I used Copic markers for the eyes, eye shadow, and the sky. The stamps I used are "Let's Face It" - P029 http://techniquejunkies.com/lets-face-it-4/ - and "Always Hope" - SD651 - http://techniquejunkies.com/always-hope/. As is her custom, Pat Huntoon is offering on all of the August Releases for Technique Junkie stamps from August 1 (today!) until August 8 (the last day of the sale). You can find all of the August Releases here - http://techniquejunkies.com/august-2015-releases/. Be sure and hop though all of the Design Team's blogs. Every one will do a different project with the sets of stamps from the August Releases. 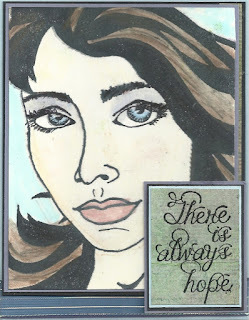 The next blog after me is with Marilyn Hughes http://DollsEtc.blogspot.com. The entire Blog Hop is listed below. Gini Cagle http://ginicagle.blogspot.com - Just before me. 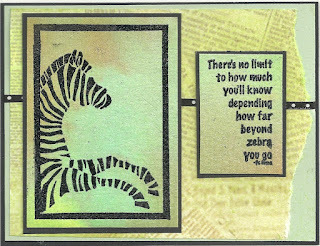 Judy Jackson http://judysstampart.blogspot.com - You are here! Marilyn Hughes http://DollsEtc.blogspot.com - Go here next. And now that you have seen all of the different blogs (wasn't that interesting?) you can go shopping from the Technique Junkie Stamps website. How many new stamps will you buy?